For serious exhibitors there are different levels of dog shows. At the top are the Championship Shows where challenge certificates can be awarded and top honours won. The most popular dog shows are General Open Shows where as the word implies, entries are open to all breeds of dog registered with the Kennel Club. Who Organises an Open Show? 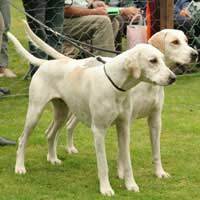 General Canine societies registered with the Kennel Club normally run two shows each year. Many of these societies also have training evenings and social events for their members. The Officers and Committee of each society are made up of volunteers with many years experience in the dog world. The committee will have booked the venue and invited the judges up to two years previous to the scheduled show as copies of the show schedule etc have to be logged at the Kennel Club. The dates of the shows have to be carefully considered so that they do not clash with major Championship Shows, or other Open shows within the same area. Nearer the time of the show the committee will be busy advertising the show, taking entries, ordering rosettes, compiling catalogues of entries and printing prize cards. Other volunteers will be ensuring that trophies won by previous winners are returned, organising the catering and selling raffle tickets. Many people start their show careers by entering these types of shows as opposed to Championship shows. There is a good mix of dogs and the level of competition suits both newcomers and experienced exhibitors alike. As previously mentioned an Open Show is open for any Kennel Club registered dog to attend. With provision for puppies through to veteran dogs (over the age of 7) there is a class to suit every dog’s ability and age. However, there are a few people who cannot enter; any judge officiating at the show is not allowed to enter a dog that they own outright or in partnership. If an exhibitor is a close relative of the judge they are not permitted to enter either.Show societies quite often have a rule that the Officers and Committee of the society will not enter or handle a dog at their own shows. This is normally a ruling because the committee has chosen and invited the judge and it would be seen to be unfair if they were placed in their class, whether they had been judged fairly or not. Will There be a Class For My Breed? There will not necessarily be a class specifically for your breed. A show society has to consider how many of each breed has entered their shows in the past and also the popularity of breeds. The show has to try to make a profit for its club and careful consideration must to be made to the type of breeds that will attract entries. If you own a dog from a particularly popular breed you will find that you have classes at most of the shows around the UK, however a breed that is less popular may not be so lucky. But do not despair, there will be plenty of classes that are listed as ‘any variety not separately classified,’ within this there will be different categories of class for dogs of different ages and levels of success. Quite often you will have a top ‘all-rounder’ judge who has also been invited to judge Best in Show, so you have the benefit of a experienced person who is qualified to judge many varieties of dog go over your cherished animal. If you are fortunate enough to be placed in your class you will be awarded a certificate of your achievement. When all the breed or variety classes have been judged the unbeaten dogs are invited back into the ring to compete for ‘best of breed.’ You will be awarded a rather smart rosette as will the winner of the ‘best puppy’ in breed class. Depending on the finances of the organising society there may also be rosettes for the dogs winning places in each class. Sometimes a local Breed Club will have sponsored the classes and there will be even nicer rosettes and perhaps a trophy to keep until the next show. All dogs that have won best of breed awards will then be able to compete for Best in Show, the same applies to winners of the puppy classes. The final bonus for winning a class is that the judge will write a critique of his winners, which will be published in the canine press several weeks later. Not every dog can be a winner every time but always remember that you always take the best dog home with you after the show! Hello, we like to join to dog show first time with our puppy 8 month old briard Emma and realy dont know wahre to start and whare we can find show close to us, we are live in Doncaster South Yorkshire.Thank you for answers and any advice.Your society Monika Botwina.